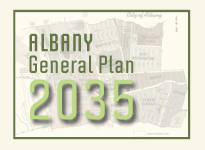 On May 22, the Albany Traffic and Safety Commission held a study session to review Draft goals, policies, and actions for the new General Plan Transportation Element. The draft incorporates existing policy direction from the Active Transportation Plan, Complete Streets Plan, and Traffic Management Plan. The Transportation Element emphasizes a balance between all modes of travel, so that residents can safely and conveniently bicycle, walk, drive, or ride public transit through the city.